I love simmer food. We often had simmer food back home. Best of all is one-pot-meals they are easy to prepare, just not as fast as I sometimes would like. I like to try out different cuisines, and getting “Mourad: New Moroccan” cookbook, I had to have a a Moroccan clay Tagine. Well I bought it because I wanted to make a lamb dish I once had. I never got that far, because I stumbled over this chicken dish, and I had to try this. You get the best flavours if you roast and grind you own spices, but even though I have a spice grinder, I alway end up using the store bought ground spices - I don't know what I'm missing out on. 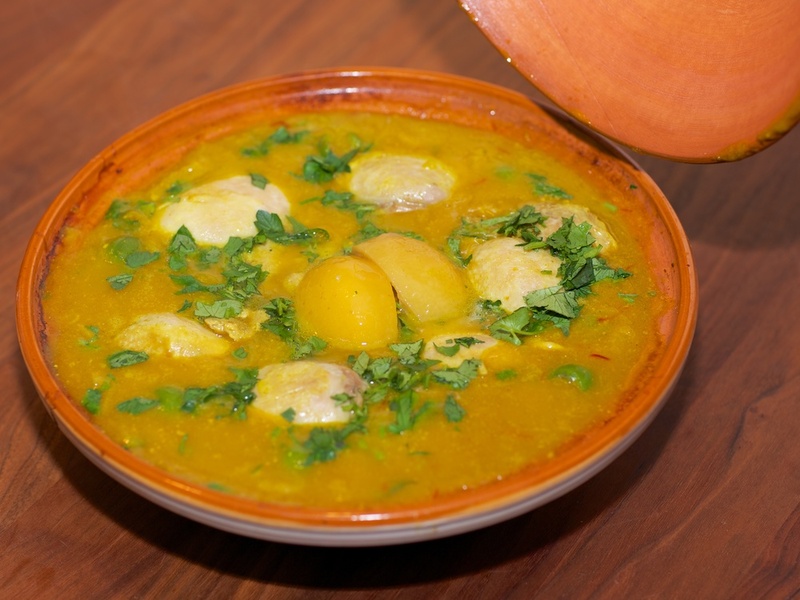 You can make this dish in a tagine or in a ovenproof skillet with a lid. When using a tagine, be sure to use a diffuser over the burner, so the tagine won't break. This is my take on the dish. Salt the chicken and let sit for about an hour at room temperature. Preheat you oven to 350 ℉ (175 ℃). Heat the fat in the tagine over medium heat. Add the chicken and sear it on both sides. Work in batches, so the chicken won't steam instead of browning. Remove the chicken from tagine. Discard the fat, and add a teaspoon new fat to tagine. Add onions and sauté for about 15 minutes or until they are tender and golden brown. Add the spices and a pinch of salt to the onions and stir constantly for about 1,5 minutes to lightly toast the spices. Return the chicken legs to the tagine, add the chicken base and water, bring to a boil. Cover the tagine and put it in the oven, and cook for 30-40 minutes, or until the chicken is tender. Remove tagine from oven and remove the chicken from the tagine. Return the tagine to the burner, and let simmer for about 3 minutes to reduce the sauce. I thicken the sauce with some cornstarch diluted in cold water. Add diced preserved lemon and green olives, let them heat through. Add herbs and season with sat. Serve the chicken with rice or couscous.